There is a whirring noise building in the background as Diane stabs out her cigarette. But it helps to showcase her two-fingered salute as she channels The Man From Another Place and says, “Let’s Rock”. 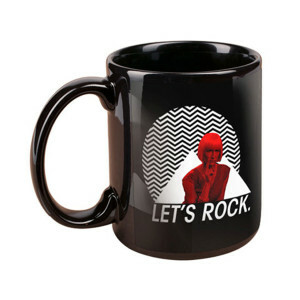 The Twin Peaks Let’s Rock Mug features Diane in red with a black and white chevron printed design in the background. This 11oz Mug is marked with the official TWIN PEAKS merchandise emblem.